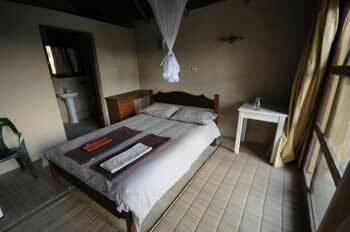 Linga Linga hotels, accommodation and places to stay. 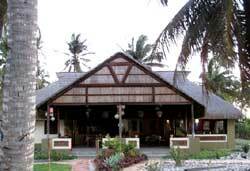 Guide to where to visit and where to stay in Linga Linga Mozambique. Linga Linga is the tiny peninsula that juts into the Inhambane Bay and here on the water's edge is Castelos do Mar luxury villa and Linga Linga Lodge self catering accommodation. 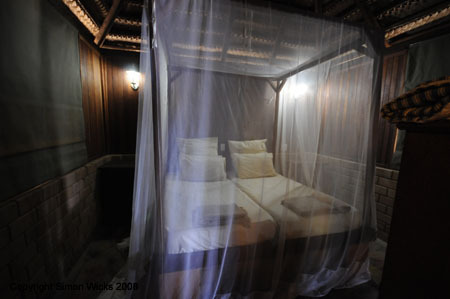 The accommodaiont at Linga Linga is set on the beach, just a stone's throw from the warm tropical waters of the Indian Ocean. 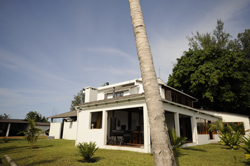 Information on Linga Linga Mozambique, location of hotels, lodges, camp sites, guest houses, bed and breakfasts and places to stay in the Linga Linga area of Mozambique. Distances from major attractions to Linga Linga and information about shops, fuel and facilities. The tiny peninsula of Linga Linga is the northern peninsula on the Bay of Inhambane. Although it is possible to reach the peninsula with a 4x4 it is much more convenient and closer by boat transfer from Inhambane. Surrounding the villa are coconut forests, as well as Mangrove Swamps. Because in exceptionally high tides, the waters rise over the sands making access by road difficult, Linga Linga is often referred to by the locals as an island. Agua Breeze Holiday Resort is nested amid pristine white sandy beaches, tropical palms swaying in the gentle breeze, on the shore of Inhambane lake and across the bay from Barra. Undeniably a perfect destination for a magical exotic vacation. Boat Transfers available from Inhambane at extra cost, please enquire when booking. (Guide Price R350 per person each way). Ngulane Holiday Resort is situated in the Inhambane province of Mozambique north of Maxixe towards the Linga Linga Peninsula and accross the bay from Inhambane and Barra Peninsula. Access to Ngulane is by road only - a 4x4 is preferred for the last 10km to the lodge. The lodge is fully serviced but not self catering. Guests must provide their own food which will be prepared at by the resident chef at no extra cost. There are braai facilities and a cash bar on site. Boat transfers from Inhambane to Linga Linga Peninsila can be arranged. A 4x4 is required to drive all the way to Linga Linga, this is difficult and time consuming. More convenient is to park in Inhambane which is reachable in a standard 2 wheel drive vehicle and take a boat transfer to the peninsula.